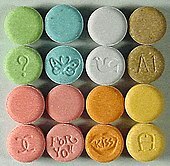 A selection of MDMA pills, which are often nicknamed “Ecstasy” or “E”. Empathogens or entactogens are a class of psychoactive drugs that produce experiences of emotional communion, oneness, relatedness, emotional openness—that is, empathy or sympathy—as particularly observed and reported for experiences with 3,4- Methylenedioxymethamphetamine (MDMA). This class of drug is distinguished from the classes of hallucinogen or psychedelic, and amphetamine or stimulant. Major members of this class include MDMA, MDA, MDEA, MDOH, MBDB, 6-APB, methylone, mephedrone, αMT, and αET, MDAI among others. Most entactogens are phenethylamines and amphetamines, although several, such as αMT and αET, are tryptamines. When referring to MDMA and its counterparts, the term MDxx is often used (with the exception of MDPV). Entactogens are sometimes incorrectly referred to as hallucinogens or stimulants, although many entactogens such as ecstasy exhibit psychedelic or stimulant properties as well. The term empathogen, meaning “generating a state of empathy“, was coined in 1983–84 independently by Ralph Metzner and David E. Nichols as a term to denote a therapeutic class of drugs that includes MDMA and phenethylamine relatives. Nichols later rejected this initial terminology and adopted, instead, the term entactogen, meaning “touching within”, to denote this class of drugs, asserting a concern with the potential for improper association of the term empathogen with negative connotations related to the Greek root πάθος páthos (“suffering”). Additionally, Nichols wanted to avoid any association with the term pathogenesis. Nichols also thought the original term was limiting, and did not cover other therapeutic uses for the drugs that go beyond instilling feelings of empathy. The hybrid word entactogen is derived from the roots en (Greek: within), tactus (Latin: touch) and -gen (Greek: produce). Neither term is dominant in usage, and, despite their difference in connotation, they are essentially interchangeable, as they refer to precisely the same chemicals. Both terms adopted and used in naming the class of therapeutic drugs for MDMA and related compounds were chosen with the intention of providing some reflection of the reported psychological effects associated with drugs in the classification and distinguishing these compounds from classical psychedelic drugs such as LSD, mescaline, and psilocybin and major stimulants, such as methamphetamine and amphetamine. Chemically, MDMA is classified as a substituted amphetamine (which includes stimulants like dextroamphetamine and psychedelics like 2,5-dimethoxy-4-methylamphetamine), which makes MDMA a substituted phenethylamine (which includes other stimulants like methylphenidate and other psychedelics like mescaline) by the definition of amphetamine. While chemically related both to psychedelics and stimulants, the psychological effects experienced with MDMA were reported to provide obvious and striking aspects of personal relatedness, feelings of connectedness, communion with others, and ability to feel what others feel—in short an empathic resonance is consistently evoked. While psychedelics like LSD may sometimes yield effects of empathic resonance, these effects tend to be momentary and likely passed over on the way to some other dimension or interest. In contrast, the main characteristic that distinguishes MDMA from LSD-type experiences is the consistency of the effects of emotional communion, relatedness, emotional openness—in short, empathy and sympathy. The chemicals below have a varying degree of entactogenic effects; some of them induce additional effects, including serenic effects, stimulant effects, antidepressant effects, anxiolytic effects, and psychedelic effects. ^ a b M., Colman, Andrew (2015). A dictionary of psychology. ISBN 9780199657681. OCLC 896901441. ^ McGregor, Iain S.; Thompson, Murray R.; Callaghan, Paul D. (2010-01-01). Stolerman, Ian P., ed. Encyclopedia of Psychopharmacology. Springer Berlin Heidelberg. pp. 758–762. doi:10.1007/978-3-540-68706-1_154. ISBN 9783540686989. ^ a b Nichols, D. (1986). “Differences Between the Mechanism of Action of MDMA, MBDB, and the Classic Hallucinogens. Identification of a New Therapeutic Class: Entactogens”. Journal of Psychoactive Drugs. 18 (4): 305–13. doi:10.1080/02791072.1986.10472362. PMID 2880944. ^ a b Colman, Andrew M. (2015). Dictionary of Psychology – Oxford Reference. doi:10.1093/acref/9780199657681.001.0001. ISBN 9780199657681. ^ a b c Nichols, D; Yensen, R; Metzner, R; Shakespeare, W (1993). “The Great Entactogen – Empathogen Debate”. Newsletter of the Multidisciplinary Association for Psychedelic Studies MAPS. 4 (2): 47–49. Retrieved 6 January 2015. ^ Metzner, Ralph (1993). “Letter from Ralph Metzner”. Newsletter of the Multidisciplinary Association for Psychedelic Studies MAPS. 4 (1). Retrieved 8 January 2015. ^ Malamud, Ozer, Yvette; Yuri, Ito (2010-01-01). Encyclopedia of emotion. Greenwood Press. ISBN 9780313345746. OCLC 934324453. ^ a b c Caiuby, Labate, Beatriz; Clancy, Cavnar (2014-01-01). The therapeutic use of Ayahuasca. Springer. ISBN 9783642404252. OCLC 876696992. ^ a b Parrott, A. C. (2007-04-01). “The psychotherapeutic potential of MDMA (3,4-methylenedioxymethamphetamine): an evidence-based review”. Psychopharmacology. 191 (2): 181–193. doi:10.1007/s00213-007-0703-5. ISSN 0033-3158. PMID 17297639. ^ F., Quenzer, Linda (2013-05-06). Psychopharmacology : drugs, the brain, and behavior. ISBN 9780878935109. OCLC 869923492.